In this project, we develop the notion of a programmable imaging system. Such an imaging system provides a human user or a vision system significant control over the radiometric and geometric characteristics of the system. This flexibility is achieved using a programmable array of micro-mirrors. The orientations of the mirrors of the array can be controlled with high precision over space and time. This enables the system to select and modulate rays from the scene's light field based on the needs of the application at hand. We have implemented a programmable imaging system that uses a digital micro-mirror device (DMD), which is used in digital light processing. Although the mirrors of this device can only be positioned in one of two states, we show that our system can be used to implement a wide variety of imaging functions, including, high dynamic range imaging, feature detection and object recognition. 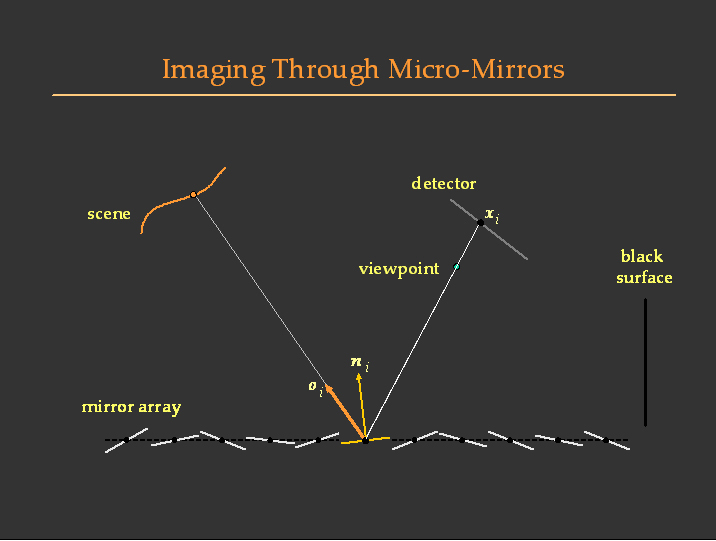 We also show how a micro-mirror array that allows full control over the orientations of its mirrors can be used to instantly change the field of view and resolution characteristics of the imaging system. 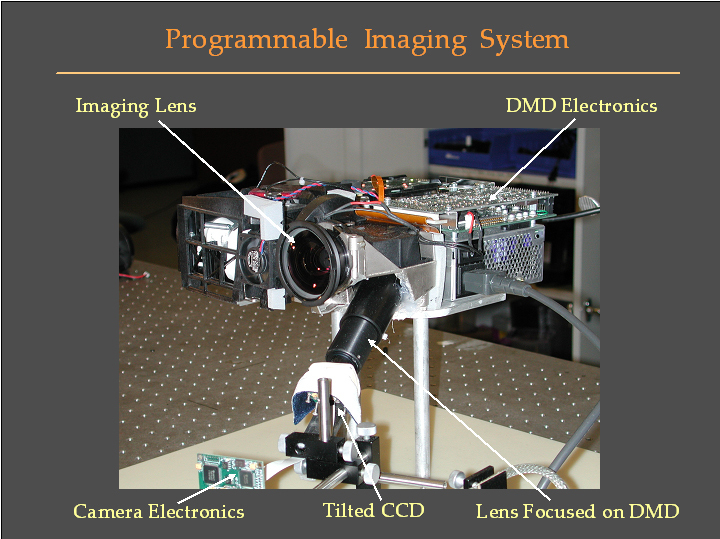 "Programmable Imaging: Towards a Flexible Camera,"
"Programmable Imaging using a Digital Micromirror Array,"
Vol. I, pp. 436-443, Jun. 2004. 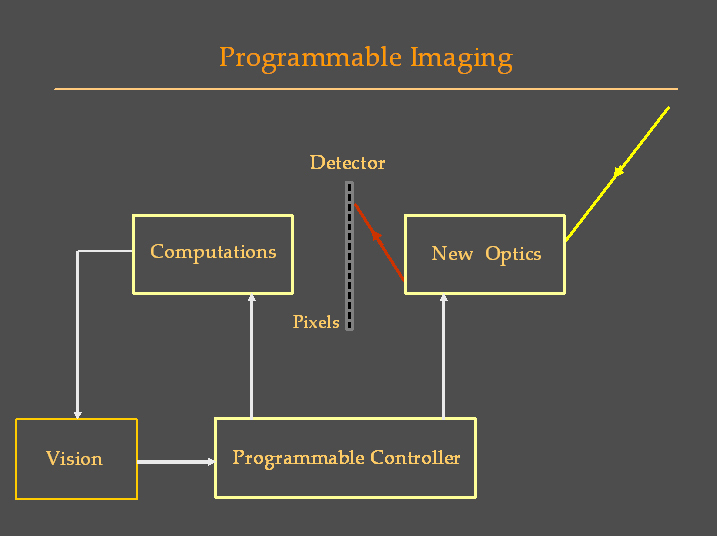 The optics and computational module of a programmable imaging system can be controlled via software to perform a wide range of imaging functionalities. This allows a single physical imaging system to emulate a variety of specialized cameras. If the orientations of the individual mirrors can be controlled with high precision and speed, scene rays can be selected and modulated in a variety of ways, each leading to a different imaging system. The end result is a single imaging system that can perform the functions of a wide range of specialized cameras. 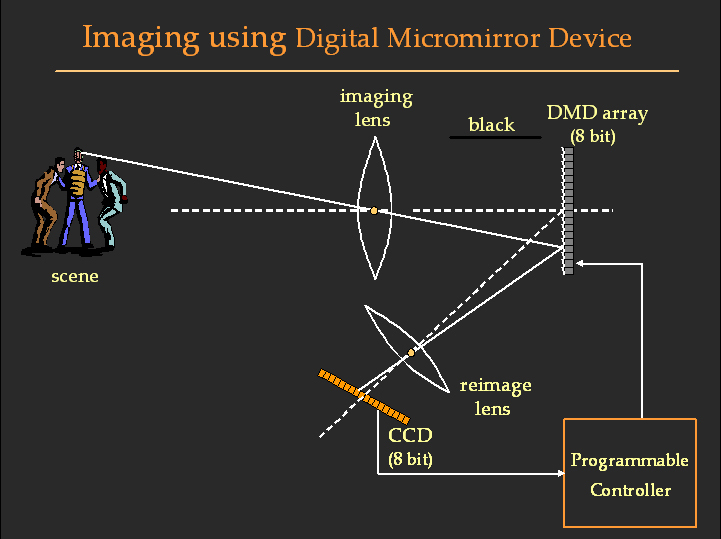 Our implementation of programmable imaging uses a digital micro-mirror device (DMD) developed by Texas Instruments. 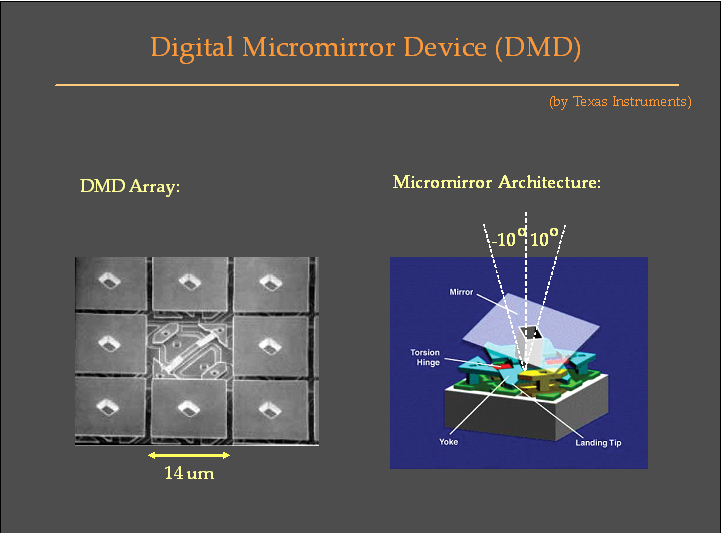 The most recent DMDs have more than a million mirrors, each mirror roughly 14x14 microns in size. The mirrors can be oriented with high precision and speed at +10 or -10 degrees. The scene image is focused onto the DMD plane. The image reflected by the DMD is re-imaged onto a CCD. The programmable controller captures CCD images and outputs DMD (modulation) images. A re-engineered LP-400 Infocus projector in which the projector lens is used as an imaging lens that focuses the scene onto the DMD. The image reflected by the DMD is then re-imaged by a CCD camera. Camera images are processed and DMD modulation images are generated using a PC. 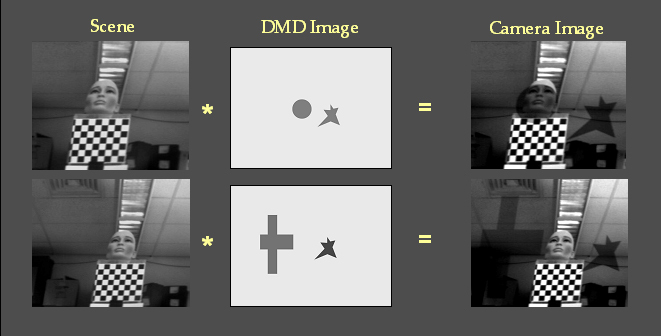 Examples that show how image irradiance is modulated with high resolution using the DMD.